What do these beauties all have in common? 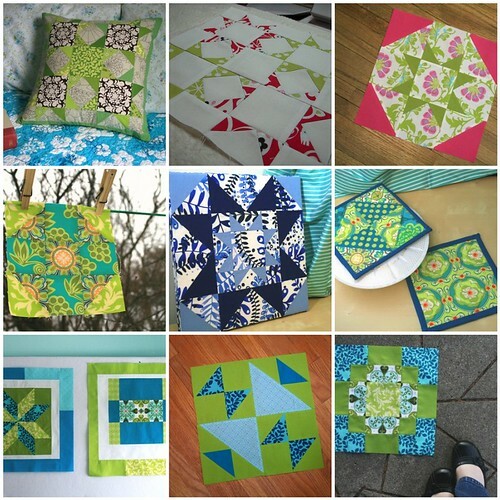 They were all plucked from the Modify Tradition blog! Have you heard about the Modify Tradition project? It's the brainchild of Jennifer & Crystal, who embrace the most traditional block patterns and transform them by using bright and modern fabrics. The effects (as you can see) are stunning. Much to my own chagrin, I haven't been able to take part in this quilt-along. However, the awesome Modify Tradition blog and Flickr pool are two of my favorite sources for inspiration & eye candy. So head on over and tell the ladies that Quilt Dad says hello! They are terrific blocks. I am going over there now to take a peek! Thanks for the links. Those bold fabrics really make great blocks! My favorite is the last block. Love the squares and rectangles. I've been admiring their bee/work too. I think it's an awesome idea! Definitely considering using one (or more!) of their blocks as my own for my month in one of my bees. Now...which one...? What fabulous inspiration! I'm bookmarking the site for upcoming quilt projects! there work is inspiring. i might just play along. thanks. Thanks so much for blogging about us! We're really enjoying collaborating on this project together. For anyone who's reading, there's a giveaway posted every week. All you have to do is answer a question to enter! thanks for the blog hint, i´ve just been there and bookmarked it already! thanks for sharing that awesome blog with us, I'm already excited to try out the different projects! btw I'm working on a wonky bento box quilt right now, thanks to your tutorial! I really liked the quilting done by Modify Tradition..Good going...keep it up. Love the colors of these blocks. I really like the idea of using classic blocks with bright fabrics.